WASHINGTON—Praising them in a memorial ceremony for all the sacrifices they had made, President Donald Trump reportedly delivered a touching tribute Tuesday to the fallen heroes of WWE. “Let us never forget how WWE continues to affect all of us, and how these brave men dedicated their lives to wrestling for their country,” said Trump in a 15-minute speech that touched on the entire history of WWE, from the powerful rise of Vince McMahon to some of its most important conflicts, including the hard-fought battles of WrestleMania X, the brutal 2002 Survivor Series, and Hulk Hogan’s pivotal 1984 victory over the Iron Sheik. “As it became clear long ago that we as a nation would need to enter the WWE ring, when we needed them most, these heroes answered the bell. They endured chokeslams, flying elbows, and piledrivers, and many of them courageously laid the smackdown to protect the freedoms of this great nation. 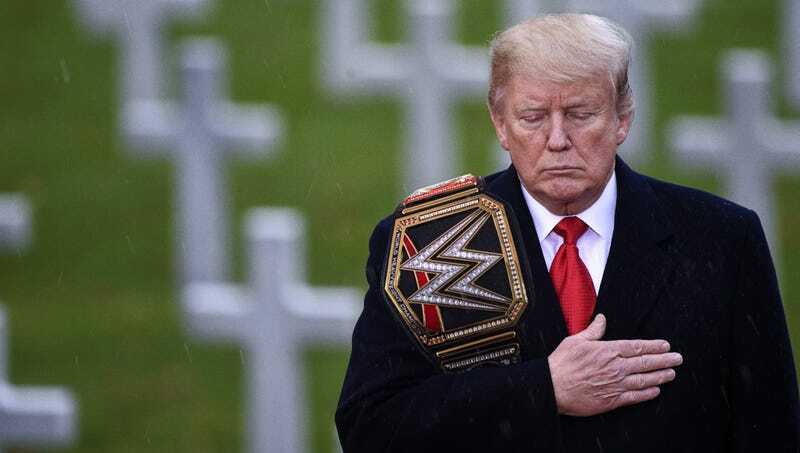 From the violent days of Attitude Era to today’s comparative peace, our nation’s courageous fighters served admirably in WWE, and today we salute them.” Trump concluded the tribute by gently placing a ceremonial championship belt at the Tomb Of The Parts Unknown Wrestler.